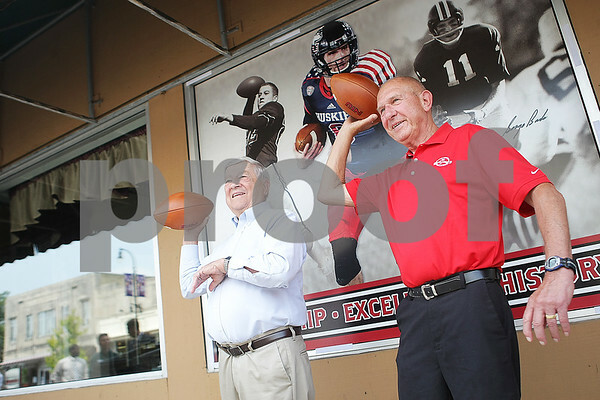 Former Northern Illinois University quarterbacks Bob Heimerdinger (left) and George Bork pose in front of the NIU quarterback greats window in downtown DeKalb on a window outside the Lincoln Inn on Tuesday, July 22, 2014. Heimerdinger, nicknamed "Huskie humdinger", played 1948-51, and was the first Huskies football player to have his #12 jersey retired. Bork, played from 1960-63, and was inducted into the College Football Hall of Fame in 1999. The window cling features Heimerdinger, Bork, and Jordan Lynch, who was not able to attend because he's preparing for the upcoming NFL season.